Gonzalo Vidano sells luxury. 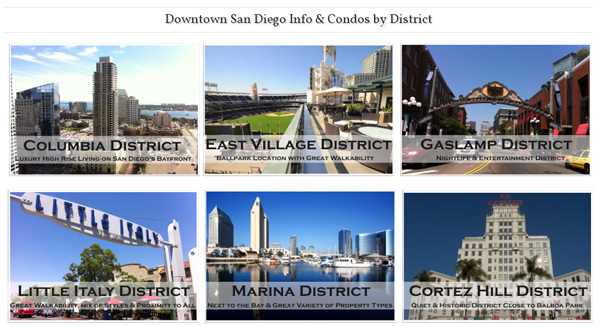 Using a clean layout, stunning area photography, content that highlights area amenities, and page after page of categorized listing data, he has created a rich experience for San Diego home buyers with his Sky Village Realty website, http://skyvillagerealty.com. We’re changing things up a bit in this month’s client spotlight and using a simple numbered list of highlights from the site. Here are 6 ways Sky Village Realty has created a site tailored for luxury home buyers using features of both dsSearchAgent and dsIDXpress to highlight listings, organize properties, and encourage lead capture. Sky Village Realty keeps their home page simple with minimalist header and navigation, followed by an oversized slideshow with only three slides – a large photo linking to downtown condos and lofts, another for ranch and coastal homes, and a third slide with a full property search form. San Diego buyers coming to his site are going to be interested in one of these two types of homes, so Gonzalo makes it easy to quickly jump to either type of listing or begin their own custom search. 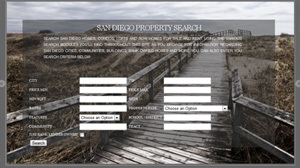 The “San Diego Property Search” in his slideshow is simply a dsSearchAgent quick search module – – but with custom font treatments, added text, and a fantastic background photo of the beach, it really stands out. Instead of providing paragraphs of content to read through about the area, most of the site content is brief and focuses on property links along with features and benefits of using his service. 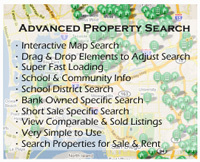 Gonzalo created a custom “Advanced Property Search” image for his side bar that links to his dsSearchAgent map search. Using a list of IDX features his buyers would care most about, it’s a great way to get people to his use his IDX search over the competition. Taking advantage of the dsSearchAgent login and registration page links, Gonzalo created a large “Create an account” call to action button for his sidebar. Listing the benefits of creating an account, it encourages buyers to register on his IDX page or login if they already have an account. Images can be powerful on a website, especially when selling a particular lifestyle. The Sky Village Realty site recognizes this and uses lots of large, professional-quality photos for each community, property type, and condo building. These are just a few of the stand-out features of Sky Village Realty’s website. Be sure to take a look through the site for more ideas and inspiration for using dsIDXpress and dsSearchAgent to build traffic and capture leads in your market. If you’d like to see your site featured here or have feedback for us, let us know! I have to say that Gonzalo has it figured out. What a great presentation piece – it gives the consumer what they want without a lot of clutter. My website has become quite busy and I am thinning the processes that I have in place. I love the fact that Gonzalo addresses the most prevalent questions that consumers have about real estate – what do homes cost, what homes are available and how much is mine worth. Very nice site – Did you do the install yourself, or someone else? The reason I ask, is that is apparent someone that “gets it” put it together… Great Job, thanks for sharing Robert as well – nice write! I actually put the website together myself. I been learning “web design” and a bit of coding for the past few years and started working on this version of the site (using wordpress) about 1 year ago. The fact that I am a Realtor helps know exactly how to structure the site based on what people want and find useful. I tried to keep it simple using lots of photos (that I took myself as well) to make the website easy to navigate and above all easy on the eyes so people don’t click out. Its been lots of work, long days and nights but very happy with the end result. WordPress is a great platform and IDX Press and IDX Search Agent amazing products to use. I basically built my site around the IDX products based on the capability of their technology. I researched many products and the guys at Diverse Solutions truly get it. I am excited for the mobile version!